Melody is a disturbed girl whose future has been written by her unfair past. Follow the prologue as she recollects distressing memories and rediscovers emotions that has once been temporarily lost in the depths of her heart. 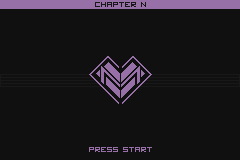 Melody: Chapter N: Death of Sound is the first chapter, and the prologue of a story that I am writing, titled Melody. Last month I released a prototype of this homebrew. I'm now releasing the final version which corrects the bugs present in the prototype, and also introduces a new color scheme, and other small details. This is the English version as I've yet to translate the text and I decided to make two separate versions instead of just one. I shall update this post with the Spanish version once it is complete. I particularly liked the change in color scheme, it works very well for the tone of the story and overall feel of the application. I can't wait to see and read what comes next!